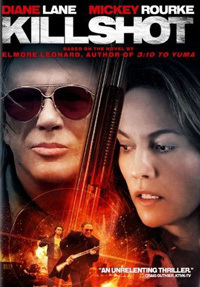 Elvis is featured in the movie "Killshot" starring Mickey Rourke, Diane Lane and Thomas Jane. One character (played by Rosario Dawson) is an Elvis fan and Elvis is mentioned several times. On the soundtrack are three Elvis songs: "Suspicion", "Doin' The Best I Can" and "It Hurts Me". After a limited theatrical release, the film has been released on DVD in US and other countries all over the world. "Burning Love" is on the soundtrack of "Ghosts of Girlfriends Past" (starring Matthew McConaughey, Jennifer Garner, Michael Douglas) and "I Got a Woman" on "He's Just Not That Into You" (starring Jennifer Aniston, Jennifer Connelly, Scarlett Johansson, Drew Barrymore and who care's about the male actors). To Jerome: "He's Just Not That Into You" has grossed $160,000,000 so it's a hit for sure, but "Ghosts..." hasn't been released yet, but most likely going to make some money, it has stars and director who has done some hit films. "Killshot" is obviously not a hit, but probably going to do just well on DVD.